This draws as a vertical 'progress bar', using $Color and $Color2. The 'progress' block is drawn in $Color2. value. If used alone it is a percentage, otherwise it is a value between min and max with the vbar being set using value as a percentage of max-min (which must thus be specified). Thus vbar(25) is the same as bar(37.5,25,75). min & max. Numerical minimum and maximum values for computing the degree of 'progress' represented in $Color2 by value; if min is not supplied, a value of 0 is assumed and negative attribute values are plotted as if zero. target. The target represents a nominal or desired result. For example, if normally writing between 0 and 4000 words on any given day, it might be useful to set a target at 1500 words/day. If setting a target, a min and max must also be set. The target line is drawn in a dashed link alternating $PlotColor and either $Color or $Color2 )whichever is the current background colour in the position of the target line. The arguments in the brackets may be numbers or expressions that can be evaluated as numbers. As $Pattern is a string parameter, remember to enclose the statement in quotes so the program coerces the output to a string. If a note's $Width is 3.0, then vbar(15*$Width) is the same as writing vbar(45). If the pattern is written without parameters or brackets, it evaluates as if at 50%, e.g. 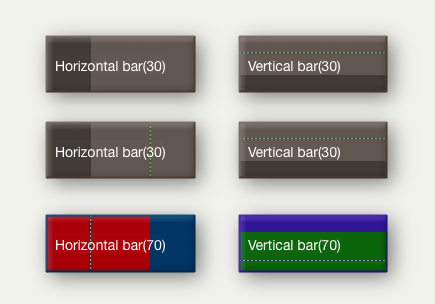 vbar() and vbar are the same as vbar(50).